It’s a feast for the senses as entertainment editor John Turnbull checks out a couple of recent thrillers — the near-silent A Quiet Place and the movie that inspired the latest, stupid internet challenge, Bird Box. One of the hardest things in the horror genre is to create a connection between the characters and the viewer — most of the time a significant proportion of the audience are just waiting for characters to be killed in new and interesting ways. This is not a problem with A Quiet Place, as after about 10 minutes you’re silently hoping that all of the characters will survive, despite how unlikely that outcome seems. The premise of A Quiet Place is that the world has been taken over by fearsome creatures that hunt by sound, reducing humanity to a silent existence. The movie focuses on a family who have settled into a practical if threadbare existence, scavenging for food and walking on trails of sand to minimise the sound of their footsteps. Led by father Lee (director John Krasinski, showing how far he’s come from The Office) and his real life wife Emily Blunt, there is a genuine familial love on display, used to brutal effect early in the first act when one of the kids can’t resist the desire to just be a kid. Speaking of children, the young actors in A Quiet Place are exceptional, particularly Millicent Simmonds as hearing impaired oldest daughter Regan. The fact the young actress herself is deaf adds a layer of realism to her performance, and she deftly matches the bravura showings from a never better Krasinski and Blunt. One thing that really stands out about this movie is the exceptional sound design; heavy breathing and whispered words ratchet up the tension, and the introduction of a baby (via silent birth in a great performance by Emily Blunt) seems destined to doom the family. Unfortunately, thinking too much about this aspect does lead to some tricky questions: how is it possible that these creatures with super hearing can’t hear people breathing heavily, or the generator that keeps the lights and computers running five years after society has fallen apart? As I’ve said before, Netflix original productions tend to be a mixed bag. In the early days, they made quality fare like Beasts of No Nation, then they signed a deal with Adam Sandler and everything just got a little bit crappier. Over the past year, there have been a few highlights (Roma, Apostle), but the ratio of killer to filler is lurching increasingly towards the latter. Heavily hyped and advertised on release, Bird Box quickly built up millions of views, although the opaque Netflix measurement system doesn’t reflect how many viewers actually watched the whole 124 minute movie and how many turned off after half an hour. I must admit that I was sorely tempted to switch off once the premise was established, about the time that I realized that this was essentially a remake of the Shyamalan/Wahlberg crap-fest The Happening. But I kept watching, dear reader, so you wouldn’t have to. The plot (such as it is) involves a mysterious phenomenon that sweeps the world, causing a wave of suicides. Ostensibly caused by monsters that are never shown on screen, this results in an almost immediate breakdown of society, with only the mentally ill (and some other random people as the plot dictates) immune from the effects. Told mostly in flashback, the story unfolds in a plodding, predictable manner, with star Sandra Bullock apparently doing everything she can to make her character supremely unlikable. Danish director Susanne Bier has made a bunch of critically acclaimed, but little-seen, Danish films including After the Wedding and In a Better World, so it’s perhaps unfortunate that she’ll probably be remembered for the excruciating pointlessness of Bird Box. The best part of this film is undoubtedly Trevante Rhodes, a gifted young actor who first gained attention in the Oscar winning Moonlight. Playing against experienced character players like Bullock and John Malkovich, Rhodes more than holds his own, and stands out as an actor to watch as his career progresses. 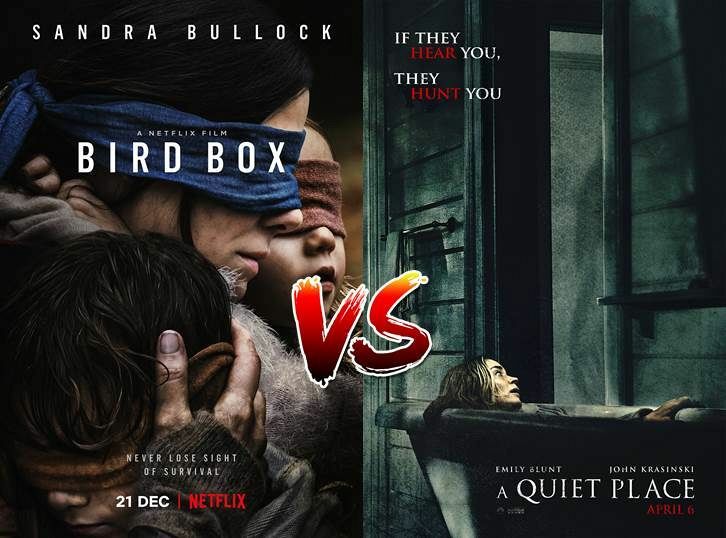 Both A Quiet Place and Bird Box play with the concept of sensory deprivation, although only one of them manages to make a human connection. By depicting a loving family just trying to keep each other alive, A Quiet Place is compelling and moving, while the impersonal approach of Bird Box (two of the main characters are called Boy and Girl, for f**k’s sake) means that you really don’t care what happens, and may even find yourself wishing that the monster would just kill them all and get it over with. A Quiet Place works because it defines the threat and, as unlikely as a beast that hunts by sound alone (yet can’t hear heavy breathing) may be, it’s a hell of a lot more plausible than whatever the hell the monster in Bird Box is meant to be. A Quiet Place is also relatively true to its internal logic, while Bird Box plays fast and loose with the laws of their universe, making the titular box of birds a warning system for the monster or its minions, except when it doesn’t work. Seriously, spending two hours walking around blindfolded would be time better spent than watching Bird Box. Make some noise. Subscribe to IA.